Andrew H. Ceifetz, P.E. ; Jeffrey Bagdade, P.E. ; Dan Nabors, P.E., Michael Sawyer, P.E., Kim Eccles, P.E. The Task Manager for this document was Rosemarie Anderson, FHWA Office of Safety. The Technical Oversight Working Group included Kaye Bieniek (Olmsted County, Minnesota), Michael Briggs (Planning Department, City of Nashville, Tennessee), Mike Castellano (FHWA), Pam Fischer (independent consultant), Hillary Isebrands (FHWA), Lance Johnson (FHWA), Kelly Larosa (FHWA), Pete McGeshick (Sokaogon Chippewa of Mole Lake, WI), Jana R. Simpler (Office of Highway Safety, Delaware), Kimberly Vachal (Upper Great Plains Transportation Institute, North Dakota State University), and Jennifer Warren (FHWA). Local road practitioners across the country play a critical role in addressing crash risks at the local level and may be able to identify the specific or unique conditions that contribute to crashes within their jurisdictions. The Local Road Safety Plan (LRSP) offers a foundation for consensus and focus. It defines key emphasis areas and strategies that impact local rural roads and provides a framework to accomplish safety enhancements at the local level. The LRSP helps communities take a proactive stance in reducing and preventing local road fatalities and injuries. This document guides the development of an LRSP. Safety Plan, Local, Rural, Implementation, Emphasis Areas, Vision, Mission Statement, Goals, Local Road, Safety. Approximately 60 percent of all road miles in the U.S. are non-Interstate, rural roads owned and operated by local entities, such as towns, counties, and tribal governments. In 2009, 56 percent of highway deaths occurred on rural roads and the fatality rate was 2.6 times higher in rural areas than in urban areas. These data underscore the need to systematically improve road safety in rural areas. All States have a comprehensive safety plan that provides a framework for reducing highway fatalities and serious injuries on public roads. This Strategic Highway Safety Plan (SHSP) is a data-driven plan that establishes statewide goals, objectives, and key emphasis areas that integrates the 4 E’s of Safety – engineering, education, enforcement and emergency services. The SHSP can assist local practitioners in addressing safety on local rural roads but a locally-focused plan is often needed to address the unique conditions that contribute to safety problems and to assist local practitioners in making informed safety investment decisions. These challenges faced by local agencies can be addressed through the creation of a Local Road Safety Plan (LRSP). Local practitioners play a critical role in addressing crash risks at the local level; an LRSP provides the framework for local practitioners to take a proactive stance to identify the specific or unique conditions that contribute to crashes within their jurisdictions. Similar to a State’s SHSP, an LRSP utilizes the 4 E’s as appropriate to address safety issues. An LRSP provides an excellent opportunity for safety stakeholders and involved agencies at all levels of government (local, State, and Federal) to work together to align and leverage resources to address the safety challenges unique to rural roads. Developing lasting partnerships that may benefit future projects. Instilling or enhancing a sense of collaboration among different disciplines. Assisting local agencies to better leverage funding. LRSPs have been successful in comprehensively addressing safety for a variety of local agencies throughout the US. The safety plans developed by these agencies have strengthened multi-disciplinary commitments to road safety. For example, Olmsted County, Minnesota prepared an LRSP that resulted in the implementation of county-wide strategies such as enhancing delineation of horizontal curves, upgrading sign and pavement markings, and providing dynamic warning signs at rural stop-controlled intersections. These and other projects initiated from identified safety strategies in the LRSP received $962,000 of Federal funds for implementation. Addressing safety on rural roads can be challenging. The development of an LRSP can serve as a cornerstone to building a comprehensive safety program to address the safety challenges on the roadways. Depending on safety needs of the jurisdiction, the LRSP will vary in size and level of detail. This guide provides the tools necessary to start a LRSP. It provides information to local practitioners about identifying stakeholders and partnerships needed to build support, tools to analyze data, and resources to identify safety issues and select safety strategies. Worksheets and other sample materials have been provided to aid in the LRSP process. Examples of programs and experiences of other agencies have also been included to provide examples of successes in implementing LRSPs and improving safety for all road users. The purpose of this document is to guide local rural road practitioners in developing a local road safety plan (LRSP). The expected result of a successful LRSP is to save lives and prevent injuries resulting from motor vehicle crashes. Practitioners may be road supervisors, engineers, planners, local officials, law enforcement officers, or others who deal with transportation issues. This guide may be referenced throughout the process of developing a LRSP to assist local rural road practitioners in improving safety in a comprehensive manner, incorporating engineering, enforcement, education, and emergency services, measures—the 4 E’s of safety—into a framework. This guidebook outlines the process for developing an LRSP. An LRSP is a locally-coordinated safety plan that provides a comprehensive framework for reducing highway fatalities and serious injuries on local rural roads. An LRSP is flexible and utilizes the 4 E’s as appropriate to establish and gain support for an agency’s local safety goals, objectives, and key emphasis areas. LRSP development is usually initiated by a transportation professional or elected official. The purpose of an LRSP is to identify key safety needs and guide investment decisions to achieve reductions in fatalities and serious injuries on local rural public roadways. An LRSP provides an opportunity for agencies at all levels of government (local, State, and Federal) and other stakeholders to work together to align and leverage resources to address the safety challenges unique to rural roads. Furthermore, the fatality rate (deaths per 100 million vehicle miles traveled) is 2.6 times higher in rural areas than in urban areas, underscoring the need to systematically improve road safety in rural areas. Over three-fourths of all road miles in the U.S. are in rural areas. Of those three million miles of rural roads, almost 80 percent are owned and operated by local entities. In 2009, rural roads accounted for approximately 33 percent of the vehicle miles traveled in the U.S. (Highway Statistics 2009 – Functional System Travel, https://www.fhwa.dot.gov/policyinformation/statistics/2009/vm2.cfm), but 56 percent of fatalities. All States already have a comprehensive safety plan. A State’s Strategic Highway Safety Plan (SHSP) is a statewide-coordinated safety plan that provides a comprehensive framework for reducing highway fatalities and serious injuries on all public roads. It is a major component and requirement of the Highway Safety Improvement Program (HSIP) (http://safety.fhwa.dot.gov/hsip/) and is developed by the State Department of Transportation (DOT) in a cooperative process with local, State, Federal, and private sector safety stakeholders. The SHSP is a data-driven, comprehensive plan that establishes statewide goals, objectives, and key emphasis areas that integrates the 4 E’s – engineering, enforcement, education, and emergency services. The purpose of an SHSP is to identify the State’s key safety needs and guide investment decisions to achieve significant reductions in highway fatalities and serious injuries on all public roads. Very often a State’s SHSP will include local and or rural roads as a specific emphasis area for safety improvements. An LRSP can also be valuable for improving roadway safety. Local road practitioners across the country play a critical role in addressing crash risks at the local level and may be able to identify the specific or unique conditions that contribute to crashes within their jurisdictions. The LRSP offers a foundation for consensus and focus. It defines key emphasis areas and strategies that impact local rural roads and provides a framework to accomplish safety enhancements at the local level, whereas the SHSP prioritizes safety needs and investments at the State level. However, the State SHSP may provide inputs to the LRSP. Likewise, the LRSP can feed the SHSP process to identify local road specific safety issues. Altogether, the LRSP is a coordinated effort that assists local agencies in taking a proactive stance in reducing and preventing local road fatalities and injuries. This document guides the development of an LRSP. An LRSP can be an effective tool for saving lives and reducing injuries on local rural roadways. While this is ultimately the purpose of an LRSP, there are other benefits that may be realized in the process of developing an LRSP. These benefits are summarized in Table 1.1. Table 1.1: Summary of the Benefits of a Local Road Safety Plan. Proactive Approach An LRSP offers a proactive approach for local road agencies to address safety issues. An LRSP can show the public and policy makers that something is being done to systematically reduce severe crashes, thereby building trust with local government officials, key stakeholders, and the general public. Develop Partnerships An LRSP provides local agencies an opportunity to improve relationships with the public, stakeholders, and across governmental agencies by working through a collaborative process. Improving road safety is a benefit for everyone involved. Cooperation An LRSP is a multi-disciplinary approach to addressing safety. Agencies are better able to develop more effective solutions and leverage resources by considering and coordinating engineering, enforcement, education, and emergency service strategies. Safer Roadways An LRSP facilitates a comprehensive approach to addressing road safety that—if successfully implemented—can lead to projects that reduce severe crashes. Safety Funding An LRSP with a prioritized list of improvements can help agencies better justify funding requests by documenting specific needs, particularly if they are consistent with emphasis areas and strategies identified in the State’s SHSP. An LRSP also shows that an agency has done its due diligence and can help an agency compete more effectively for limited funds. Managing Liability An LRSP is one of several proactive risk management techniques that demonstrate an agency’s responsiveness to the safety needs of the public. Having a champion: A champion advocates for the LRSP and gathers the political support to assist in its implementation. Developing a clear vision and mission: A strategic vision and mission unite all stakeholders with a common goal. Assembling collaborative partners: Partners collaborate to implement the plan. Allocating appropriate resources: Manpower and management are essential for ensuring a plan’s success. Establishing open communication: The LRSP owners should foster open and frequent communication with stakeholders, community partners, and citizens as they develop and implement the plan. If one of these components is not initially available, the plan should still move forward, as other components may be added or expanded as the plan is refined. For example, the plan may begin with a champion, but partners may be added as the plan develops. In fact, the plan itself may help attract partners. Practitioners who are interested in developing and implementing an LRSP should also be fully aware of the other strategic goals within their organization and how the proposed LRSP will complement those goals. As shown in Figure 2.1, developing an LRSP consists of a general six-step process. The process is cyclical; when the last step of the plan is completed the process starts all over again. The intent of this approach is to provide a framework of the key steps in developing an LRSP, but this can be tailored to the unique needs and circumstances of the locality. Figure 2.1 Structure of a Local Road Safety Plan. The safety champion, whether appointed or selected by the plan proponents, will advocate for its successful development, implementation, and evaluation. This person typically will have a keen understanding of the importance of moving forward with plan implementation and have some influence in acquiring and the use of safety resources. Champions may include a public works official, local engineer or transportation official, law enforcement officer, elected official, community administrator, or local citizen. Establishing a charter or memorandum of understanding to clarify each working group member’s role. Analyzing data (crash, traffic, etc.) to look for trends or potential problem areas. Identifying public, private, and non-profit funding sources to implement the LRSP. Marketing the LRSP through a communication plan with key messages for active public involvement. Encouraging local groups (civic organizations or business improvement districts) to adopt common safety goals as part of their plans. Participating in LRSP implementation efforts and tracking progress after the initial plan is developed. One strategy to initiate and formalize the function and roles of the working group is to hold a kick-off meeting for the LRSP. A block of time, approximately one hour, should be set aside for this initial meeting which may be useful inidentifying stakeholders, discussing ideas, or planning a future schedule for implementation. A sample agenda for a working group kickoff meeting is provided in Appendix A. The sample agenda includes introductions, defining the LRSP and describing the benefits, the identification of other agencies or participants that should be invited, and information for the next meeting. The specific topics included in the kickoff meeting agenda should be at the discretion of the organizer. If an initial crash analysis has been conducted, this would be appropriate to present at the project kick-off to identify the scope of the safety challenge within the locality. If possible stakeholders may begin to outline key emphasis areas; however, covering essential items such as the logistics for regular meetings may be sufficient for the kick-off meeting. The most important outcome of the kick-off meeting is to establish a commitment to create the plan and set a meeting schedule for the future. The working group identifies and contacts LRSP stakeholders—individuals who have a vested interest in road safety. Stakeholders should include decision makers who can further the LRSP process by helping to plan, implement, and evaluate the progress of achieving the safety goals outlined in the LRSP. Typical LRSP stakeholders are listed in Table 2.1. Table 2.1: Local Road Safety Plan Stakeholders. Stakeholders working together as a team can eliminate redundancy, increase program efficiency, and leverage limited resources. Active communication among organizations, whether at the Federal, State, regional, local, or Tribal level, can create a collaborative environment that results in reduced crashes by allowing diverse agencies to share expertise and unique ideas. It is critical that working group members are identified and make a commitment to pursue the safety vision and goals. As the plan evolves, local citizens should also be consulted for input and feedback. NCHRP Report 501 offers ideas for integrating and coordinating multi-disciplinary (4E) efforts within a jurisdiction and determining the most effective combination of strategies (NCHRP Report 501 Integrated Safety Management Process is available online at http://onlinepubs.trb.org/onlinepubs/nchrp/nchrp_rpt_501.pdf). While each safety management team is different, common themes of coordination, communication, and collaboration are paramount and are the hallmarks of a successful team approach. Regular meetings, more frequent in the development stages, should be convened to show incremental progress in the plan; this will help maintain momentum and focus. Consistent, effective communication is necessary to disseminate key information to team members and to relay key messages to the community. Finally, a collaborative environment between the involved stakeholders is required to identify barriers and to develop consensus on which safety challenges to address. Even within a single organization, unique knowledge of assets may be known by different members of the staff or departments. An LRSP provides a framework for sharing and preserving this institutional knowledge. Goals are set to achieve a mission and vision. Goals should be linked to the mission statement and should be realistic. For example, “saving lives and preventing serious injuries over the next decade on our local county roads” is concise and easily understood. It creates the need to move forward because it prompts action. An LRSP can be a grassroots effort. Several LRSPs began as a basic conversation on road safety within a local agency. Gaining support from community leaders, such as a city or county council, will aid in the development of the plan and impact outcomes. Sharing ideas and gaining feedback from a group of leaders can help gain support. People who are consulted in developing a plan will feel a greater sense of ownership, and will be stronger advocates for a plan they helped develop. Around the country, a variety of agencies have taken the lead in the development of an LRSP. These range from city or county road agencies to an MPO or a Tribe. In States with limited local roadway ownership, the State DOT may take the lead. Several case studies illustrating how agencies have developed an LRSP can be found in Section 4. The purpose of the latter is to provide guidance on the sources of safety data needed and on the procedures for selecting strategies within a given emphasis area and targeting those treatment strategies to either roadway locations or road-user groups. Highway Safety Manual (HSM) - The first edition of the HSM provides the best factual information and tools in a useful form to facilitate roadway planning, design, operations, and maintenance decisions based on precise consideration of their safety consequences. The primary focus of the HSM is the introduction and development of analytical tools for predicting the impact of transportation project and program decisions on road safety. Further information may be found at http://www.highwaysafetymanual.org/Pages/default.aspx. Interactive Highway Safety Design Model (IHSDM) - includes six evaluation modules: Crash Prediction, Policy Review, Design Consistency, Traffic Analysis, Driver/Vehicle, and Intersection Review. The Crash Prediction Module (CPM) implements Part C (Predictive Method) of the HSM for evaluating rural 2-lane highways, rural multilane highways and urban/suburban arterials. Further information may be found at https://www.fhwa.dot.gov/research/tfhrc/projects/safety/comprehensive/ihsdm/. Crash Modification Factors (CMF) Clearinghouse - includes a Web-based database of CMFs along with supporting documentation to help transportation engineers identify the most appropriate countermeasure for their safety needs. Further information may be found at http://www.cmfclearinghouse.org/. SafetyAnalyst - incorporates state-of-the-art safety management approaches into computerized analytical tools for guiding the decision-making process to identify safety improvement needs and develop a system wide program of site-specific improvement projects. Further information may be found at http://www.safetyanalyst.org/. Crash and other safety data are used to identify safety issues, select appropriate countermeasures, and evaluate performance. The analysis used in the development of an LRSP usually looks at the bigger picture and does not focus on analyzing crash data for a specific site. If crash data are not readily available, other safety-related data or crash risk assessments (such as locations with geometric similarities as locations of known concern) can help identify safety issues and concerns. Other data may include traffic citations, hospital records, insurance claims, speeds, traffic counts, and in some cases anecdotal evidence from safety partners. If local agencies encounter data challenges, the Road Safety Information Analysis: A Local Rural Road Owner’s Manual provides strategies in the collection and analysis of crash and other roadway data (http://safety.fhwa.dot.gov/local_rural/training/fhwasaxx1210/). Crashes by severity and type for the entire city/county. Crashes by severity and type by roadway functional classification or type. Restraint use (seat belts, car seats). The analyses of these data could range from simply marking locations on a map to tallying common factors in a list, or using a spreadsheet application to determine trends by location, crash type, or other contributing factors. When State or local-jurisdiction crash data are not available or adequate, other sources to identify safety issues include hospital/emergency responder records, towing company records, insurance databases, or by conducting road safety ratings. Road safety ratings may be based on the presence of specific roadway or roadside designs, traffic control features, or other features that can be used to assess crash risk. For example, the United States Road Assessment Program (usRAP) provides a method to identify major safety shortcomings through a program of systematic assessment of risk. The result is a star rating of roadway safety. Details on the usRAP process and methodology can be found at http://www.usrap.us. An agency may conduct an observational study or a road safety audit (RSA) to gain a better understanding of safety issues. An RSA is the formal safety performance examination of an existing or future road or intersection by an independent, multidisciplinary team (http://safety.fhwa.dot.gov/rsa/). RSA’s may also be conducted to identify safety concerns at either a single location or along a corridor. Details on RSAs can be found at http://safety.fhwa.dot.gov/rsa/. The working group should identify the key emphasis areas of the LRSP. An emphasis area is an area of opportunity to improve safety through a comprehensive 4 E approach (engineering, enforcement, education, and emergency services), if appropriate. The emphasis areas should be consistent with trends identified during the data analysis. In some cases, if data are unavailable, emphasis areas may address concerns of the various stakeholders and the community. Local citizens should be given the chance to identify areas of concern. Methods to reach out to citizens may include public forums, open-house meetings, an internet survey, or via a request for comments advertised in the local newspaper. Education gives drivers information about making good choices, such as not texting while driving, avoiding alcohol or medications affecting level of consciousness, wearing a seatbelt, or informing people about the rules of the road. Enforcement of traffic laws and a visible police presence tend to deter motorists from unsafe driving behavior. Engineering addresses roadway infrastructure improvements to prevent crashes or reduce the severity of collision when they occur. Emergency services provide rapid response and quality of care when responding to collisions causing injury by stabilizing victims and transporting them to other facilities. Combining the efforts of multiple strategies, such as education and enforcement can increase the likelihood of success in improving safety. The emphasis areas chosen for inclusion in the plan should reflect a balance of local issues identified by the working group and the resources (financial, expertise, and time) available to put them into practice. If an emphasis area is critical but does not currently have resources, it should still be included with the constraints listed. Sample emphasis areas are presented in Appendix B. NOTE: For more information on these countermeasures and strategies, consult the National Cooperative Highway Research Program (NCHRP) 500 Series Guidance Documents, available at http://www.safety.transportation.org, or the Federal Highway Administration’s (FHWA’s) Crash Modification Factor (CMF) Clearinghouse at http://www.cmfclearinghouse.org. Ideas for education and enforcement countermeasures can be found in NHTSA’s Countermeasures that Work. Tools, training, guidance, and countermeasures for rural and local governments can be found on FHWA’s website http://safety.fhwa.dot.gov/local_rural/training/. 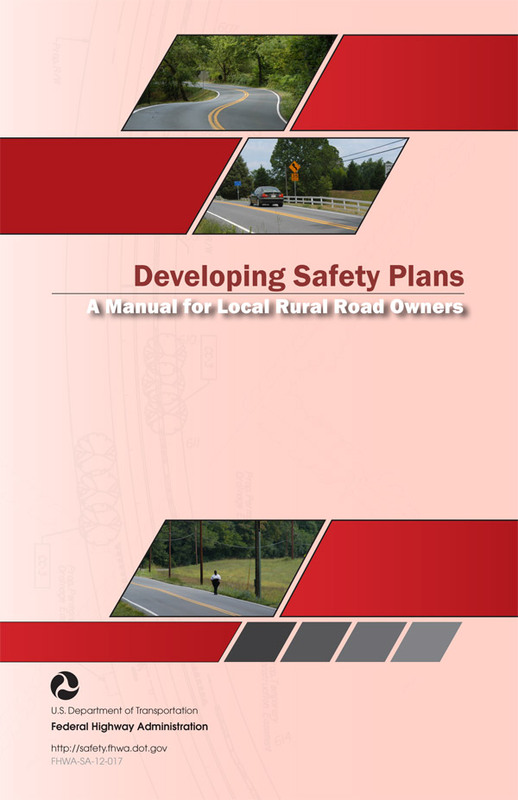 Several manuals for local rural road owners are available that address intersection safety, roadway departure safety, safety information analysis, speed management and non-motorized transportation. Depending on the amount of time and number of people involved, dividing the emphasis areas among people or groups may be a useful allocation of manpower. If a person or group indicates a strong interest in targeting a particular emphasis area, they may form an emphasis area team. Emphasis area teams would be responsible for tasks such as the data analysis, strategy selection, implementation, tracking, reporting and evaluation of their assigned emphasis area. at details responsibilities for implementing an action, desired outcomes, dates, and performance measure(s) for monitoring and evaluation, as shown in the example outlined in Figure 2.2. This table is also included as a template in Appendix C.
Figure 2.2: Emphasis Area Table. Reduce the frequency and severity of crashes at signalized and unsignalized intersections A reduction in intersection crashes, particularly severe intersection crashes for the Town of Sylvia and in the surrounding areas. Emphasis areas are based on the data analysis completed early in the LRSP process. Some examples include pedestrians, intersections, roadway departure, impaired driving, distracted driving, aggressive driving, commercial motor vehicles, motorcycles, and improving data. For other examples of emphasis areas, consider reviewing the American Association of State Highway and Transportation Officials (AASHTO) Strategic Highway Safety Plan (AASHTO SHSP: http://safety.transportation.org/), which focuses on 22 key emphasis areas and contains strategies designed to improve each area’s major problem areas or to advance effective practices by means that are both cost-effective and acceptable to a significant majority of Americans. The AASHTO SHSP divides the 22 key emphasis areas into six major categories: Drivers, Special Users, Vehicles, Highways, Emergency Services, and Management. Appendix B provides examples of additional emphasis areas, possible performance measures, and potential strategies. Not all of the potentialstrategies may be applicable to all locations and their effectiveness, if applied, may vary. An LRSP should include a list of strategies focused on addressing the emphasis areas. Strategies will be based on identifying, categorizing, and reviewing high-priority corridors or intersections for improvement. These are locations where safety improvements are most needed to achieve the goals in the LRSP and can form the basis for system-wide improvement strategies. Strategy selection will also be based on effective and validated practices. The education component may include campaigns to educate the public about the dangers of speeding. The enforcement component may involve the use of automated enforcement. The engineering component may call for the installation of speed feedback signs. The emergency service component may require the enactment of strategies targeted at reducing response time for first responders, thus increasing the chance of survival for a person involved in a crash. Crash Modification Factor (CMF) Clearinghouse. Highway Safety Improvement Program (HSIP) Manual. Roadway Safety Noteworthy Practices Database. Intersection Safety: A Manual for Local Rural Road Owners. Roadway Departure Safety: A Manual for Local Rural Road Owners. Please see the resources section for links to these references. Local ordinances and local government policies addressing local road safety may help support efforts to meet the goals and objectives of the LRSP and increase public awareness of driver behavior issues. For example, if speeding is identified as an emphasis area, certain agencies may be able to pass local ordinances targeting speeding through increased fines or the use of automated speed enforcement. A champion sitting on the local council may be helpful in identifying additional policies and passing appropriate ordinances. This is often a good time to initiate an educational campaign to increase public awareness of the ordinances. Formalizing policies can also help to improve and institutionalize safety. For example, a locality can develop polices related to maintenance of signs and pavement markings, provision of pedestrian features, transverse rumble strips, or vegetation removal. These policies can also serve as proactive risk management tools if they improve and institutionalize safety, by showing a measured approach towards improving safety. The proposed strategies for each key emphasis area should be prioritized by comparing the benefits and costs of implementation. This comparison can help the implementation phase by starting with the strategies that provide the highest benefit (e.g., reduction in crashes) for the least cost. However, costs and benefits are not the only considerations. Other considerations for prioritization include the availability of manpower (e.g., does the county maintenance staff have time available to trim vegetation over the summer), the schedule for implementation (e.g., are there short-term strategies that can be implemented rather quickly), and the relative importance of each emphasis area. The working group can determine an agreed upon priority for the strategy with these considerations in mind. The Lafayette MPO case study, included in Section 4, includes three of the MPO’s highest-priority challenges. These were used to define the four main goals of the plan, and the final recommendations proposed can be traced back to the priorities. Before drafting the plan, some thought should be given to the various approaches that will be used to implement the strategies. Some strategies will be implemented as part of a systematic improvement process such as providing rumble strips along rural corridors as part of a summer paving program. Other strategies may be part of a one-time event such as an enforcement blitz or a spot improvement program such as installing protected left turn phasing at critical intersections. Because the plan will involve multiple agencies and different types of strategies, several approaches for implementation will be used. Depending upon the resources available, a draft plan can be created to cover the basic elements, as shown in Figure 2.3, or to create a more advanced framework for anticipated growth. An advanced framework may include emphasis areas with resource or institutional barriers or may require assistance from another level of government (e.g., adopting a primary seatbelt law). Figure 2.3: Sample Outline of Draft LRSP. After a brief introduction that discusses the current condition of the local jurisdiction with respect to roadway fatalities, the purpose of the plan and how the plan will help reduce fatalities and serious injuries, the plan should state the mission and vision for safety partners to work towards. The plan should discuss what data were gathered and analyzed and present the decision process regarding which emphasis areas were selected to include in the plan. Each emphasis area should identify an objective, goal, performance measures, and strategies. Defining the objective should tie back to the overall vision statement (e.g., to reduce roadway departure fatalities by 10 percent by 2020). The performance measures should monitor the progress in attaining the objective. The strategies should be listed by priority actions that can be performed by the 4 E’s as appropriate. Each strategy should include a performance measure. These strategies will be incorporated in the action plans that are created for each emphasis area, as suggested in Figure 2.2. Each section should be expanded with supporting information, such as tables or charts describing the crash data analysis results, maps detailing the area included within the plan, and photos representing areas of concern. A template for an LRSP can be found in Appendix D.
Successful LRSPs are monitored for implementation progress. This helps provide accountability and can be used to keep stakeholders informed and engaged. Milestones should be set to measure progress, which may entail meeting periodically to determine if strategies that support emphasis areas are being implemented. By monitoring progress opportunities for collaborating on implementing strategies could be realized, which may assist with implementation. It is also important to keep a record of the implementations to serve as a historical record of completed strategies. This data will be essential in scheduling evaluations of the strategies implemented. Number and type of public comments and concerns. Numbers and types of police citations. These MOEs are observed during a field study. The MOEs should be observed under similar periods and durations before and after implementation. Traffic volume data can help provide context on the results. If sufficient crash data are available, a simple before-after study that compares the number of crashes before implementation to the number of crashes after implementation can be conducted to determine the effectiveness of implemented strategies. Typically a decrease in crashes would indicate that the treatment has successfully improved safety. However, to verify that a decrease in crashes is due to the strategies implemented and not a reduction in trips, before and after traffic data should be collected and compared between periods. The effectiveness of each strategy should be compared to the goals for each emphasis area. This is the ultimate measure if the LRSP is achieving the desired improvements in safety. The working group should review the LRSP, examine progress, evaluate effectiveness, and, if needed, suggest changes or modifications to the plan. This ongoing evaluation of the LRSP may present opportunities to improve the plan. Advances in roadway development, legislation, and technology may also invite opportunities to update the plan. The working group should review these advances for possible incorporation into the plan. Regularly scheduled updates allow the working group to review what is working well and adjust what needs improvement. Establishing a regular evaluation and update cycle can assure routine examination of the plan and maximize the plan’s effectiveness. When developing an LRSP, agencies may be confronted with challenges from lack of personnel and data to funding restrictions and/or limitations. Resolving these issues provides an opportunity to build new alliances, collaborate with other organizations, and secure new sources of funding. Guidance related to these challenges follows. Local Technical Assistance Program (LTAP) and Tribal Technical Assistance Program (TTAP) centers, universities and other research institutions that work on transportation safety issues may also be available to provide assistance in the development of an LRSP. State DOTs and Regional MPOs or Regional Planning District Commissions may be able to assist with an LRSP. These agencies have resources or information on the development of LRSPs and about other LRSPs previously developed. Some agencies have engaged a consultant to help create their LRSPs. A consultant may be able to bring additional expertise to the project. Other organizations, such as AAA and local community groups, may be able to assist in the development of an LRSP as well. This may include creating a broad coalition of participants such that volunteers and other resources can be leveraged. Limited funding is often a concern to most road agencies as they seek to implement roadway safety improvements. Agencies may also be concerned about how they will fund projects identified within an LRSP. In many cases, having an LRSP in place will increase an agency’s ability to secure funding to implement its safety strategies when competing for funding resources. An LRSP can also be useful for leveraging private funds from local businesses and corporations interested in investing in traffic safety. An LRSP can be developed using in-house staff in coordination with other agencies, thereby limiting the costs of time and financial resources spent developing the plan. Several options for funding both the development of an LRSP and the implementation of its strategies are discussed below. Contacting the State’s DOT or other county and local transportation entities may help identify other funding opportunities. An MPO or Regional Planning Organization (RPO) may be able to allocate financial assistance for developing a plan. While money may appear to be a significant hurdle to the implementation of an LRSP, funding sources are available, and having an LRSP will typically increase an agency’s ability to secure funding to implement its strategies. Limited data should not inhibit the development of an LRSP. Sources of crash data include NHTSA’s Fatality Analysis Reporting System (FARS), the State DOT, raw law enforcement data, or the existing SHSP. Data, such as traffic citations, hospital records, and speed monitoring, can also be used in the development of an LRSP. Other risk assessment processes, such as road safety audits or the usRAP, which provide methods to identify major safety shortcomings through a program of systematic assessment of risk as discussed in Section 2, can be used to identify safety issues for an LRSP. In many cases, agencies use their LRSPs to develop strategies to improve their local data. By including data collection as an emphasis area within an LRSP, an agency or group of agencies can begin to assess gaps in data and develop strategies for improvement. Roadway Safety Information Analysis: A Manual for Local Rural Road Owners was developed by FHWA to provide strategies in the collection and analysis of crash and other roadway data. This document can be found at http://safety.fhwa.dot.gov/local_rural/training/fhwasaxx1210/. LRSPs have been implemented by a variety of jurisdictions around the US. This section contains examples of programs implemented to address local rural safety issues. The agencies in Champaign County mapped out a unified strategy in a multi-disciplinary LRSP (originally called a Comprehensive Highway Safety Plan). This was an effort to continue their commitment to road safety following the State Farm Embedded Safety Specialist Pilot Initiative (ESSI) which was launched in December 2006 in Champaign County, Illinois. ESSI was designed to develop and implement strategies for improving safety by reducing crashes instilling a more integrated safety culture within participating agencies. The plan envisioned cooperation by various agencies. Each agency’s engineering department would be able to accomplish the engineering aspects of the plan, having both the authority and responsibility to build and maintain a safe road system. Challenges were also identified, including securing sustainable funding and developing partnerships with organizations that can assist with the education and enforcement aspects of the plan. Providing a structured and realistic set of responses that implement changes over time. Integrating a 4-E approach in its proposed solution strategies. Identifying road safety partners that could sustain a long-term effort. Identification of the Champion and Safety Partners: The champion was the MPO, Champaign-Urbana Urbanized Area Transportation Study (CUUATS). CUUATS took the lead on the implementing the process. An important part of the plan process was the identification of road safety partners already in the community. The LRSP served as a basis for setting up a county-wide safety committee which included engineering, enforcement, education, and emergency service representatives. The partners provided substantial input associated with problem identification and prioritization, as well as recommended solutions that were incorporated into the Comprehensive Highway Safety Plan. A Gap Analysis: As a part of the Comprehensive HighwaySafety Plan process, agency interviews were conducted to identify safety concerns. Network Screening: Network screening was a systematic process that extracted from the Illinois Department of Transportation (IDOT) Local Accident Reference System (LARS) database useful information on the risk and potential mitigation of crashes at locations in Champaign County. Alcohol and other impaired drivers. Safety belts / occupant protection. A set of 36 education, enforcement, engineering, emergency service, and institutional strategies was developed to improve safety in response to these concerns. These strategies were summarized and timeframes were recommended for implementation. Through the committee, a variety of intersection and corridor studies were implemented within the county leading to a number of RSA’s, HSIP-funded safety projects, and a teen driver safety initiative. Financed through grants from FHWA and the Federal Transit Administration (FTA), the Lafayette Consolidated Government MPO sought to develop an LRSP (originally called a Transportation Strategic Safety Plan). The plan included more than 250 strategies that incorporated the 4 E’s and varied by cost, proven effectiveness, and the number of partners, among other factors. Lafayette Parish has a high fatality crash rate that is well above the State average. High-priority challenges were identified: obtaining crash data from parishes and municipalities included in the MPO study area, re-establishing and improving current relationships among enforcement agencies and emergency services, and establishing new relationships among enforcement agencies and Emergency services in parishes now included in the MPO Study Area. More than 30 agencies were identified as key stakeholders in fostering collaboration, including school systems, law enforcement agencies, cities, departments of safety and transportation, and citizen committees. Protection of drivers and passengers. Protection of all roadway users, such as pedestrians, bicyclists, and motorcyclists. The most important goal was driver and passenger protection. Louisiana has been a “primary” enforcement State (i.e., one in which a driver may be pulled over solely for not wearing a seatbelt without needing any other visible infraction) with regards to safety belt usage since 1995, as the most obvious form of occupant protection is the safety belt. Maximizing the use of occupant restraints by all vehicle occupants. Insuring that restraints, especially child and infant child safety seats, are used properly. Providing access to appropriate information, materials, and guidelines for implementing programs to increase the use of safety restraints among vehicle occupants. The plan also listed all of the objectives and strategies along with the associated lead department or agency responsible for their implementation to include partners, approximate cost, and effectiveness. Number of unbelted fatal and serious injury crash victims and proportion of all fatalities. The plan includes details about annually reviewing performance measures and guidelines as to how changes may be implemented. Additionally, there is a section devoted to funding implementation and continued management of the plan. Know Your Traffic Law Program - To educate the public about traffic safety and other risky behavior commonly experienced by Lafayette motorists. Safety Town – To construct a permanent, interactive education facility where children learn about traffic safety in a safe environment. Safety Fair – To educate youth about the basics of road safety. DWI Crash Emergency Room Program – To provide mobile trauma room demonstrations from high school to high school. Judicial Community Service Plan for Traffic Violators – To have judges assign community service hours based on the MPO Safety Plan. Olmsted County prepared an LRSP as part of an effort to reduce the number of fatal and serious injury crashes that occurred on its system of highways. It was part of a coordinated effort with the Southeast Minnesota Towards Zero Deaths organization and the sheriff’s department to identify opportunities for targeted enforcement campaigns. The traffic safety priorities identified were based on the data-driven analysis of approximately 11,000 crashes that occurred in Olmsted County between 2003 and 2007. The analysis was done in accordance with the guidelines for Federal transportation safety funds and Minnesota’s SHSP. Conducting a comprehensive crash analysis, including system (i.e., State vs. local), severity, location (i.e., urban vs. rural), intersection-related vs. road departure, and crash type. Identifying Olmsted County’s safety emphasis areas (22 identified causes of crashes). Identifying a short list of high-priority proven safety strategies effective at reducing specific types of crashes. Identifying locations on the county’s highway system that were most at-risk based on a variety of system-wide factors. Identifying safety improvement projects that would be eligible for funding through the State’s HSIP. Driver behavior – young drivers, aggressive driving, impaired driving, and seat belt usage. Highways – road departure and intersections. Potential safety improvement strategies for each of the emphasis areas were evaluated. The initial list came from the NCHRP 500 Series Reports. Someproposed strategies were then eliminated from further consideration because they were considered too expensive or were experimental strategies that had no history of application in Minnesota. A safety strategies workshop was held in Olmsted County and was attended by 50 safety partners representing the State, county, townships, and cities, as well as the Mayo Clinic, bicycle advocates, and driver education professionals. The two primary objectives of the workshop included sharing the results of the analytical process and providing a forum to discuss the short list of safety strategies. The participants further prioritized the safety strategies from highest to lowest. Improving the edges of rural highways and enhancing delineation of horizontal curves in rural areas. Upgrading the signs and pavement markings, installing street lights, and providing dynamic warning signs at rural stop-controlled intersections. Adding technology at signalized intersections to support increased enforcement levels for red light running. Adding channelization and median islands to restrict/control turning maneuvers at urban stop-controlled intersections. The potential improvements were low-cost in nature and aligned with the State’s SHSP, placing Olmsted County in a position to qualify for HSIP funding. The Wisconsin Department of Transportation (WisDOT) commissioned a multi-disciplinary Tribal Highway Safety Plan to map out a unified strategy to address highway safety on tribal lands within Mole Lake, Wisconsin. Several challenges associated with implementing the plan were identified, including securing sustainable funding and developing partnerships with organizations that can assist with the education and enforcement initiatives outlined in the plan. Key stakeholders were identified and partnerships were formed between the Sokaogon Chippewa of Mole Lake, WisDOT, the Forest County Sheriff’s Department, and the Forest County Highway Administration. Interaction of Modes (All-Terrain Vehicles [ATVs], Snowmobiles, Dirt Bikes). Objectives were identified for each of the key safety issues, with short-, medium-, and long-term initiatives in engineering, enforcement, education, and emergency services proposed for each. Reduce speed- and behavior-related collision frequency and severity, and promote observance of speed limits and traffic control devices to improve safety for all road users. Potential strategies were identified to reduce speeding in the areas of engineering, enforcement, and education. Targeted education campaigns to high-risk populations (short- and medium-term). Public Service Announcements (short- and medium-term). Coordination with WisDOT on speed enforcement grant through the Bureau of Transportation Safety (BOTS) or the Bureau of Indian Affairs (BIA) (short-term). Targeted enforcement, by time or location (short- and medium-term). Use of permanent speed feedback displays at locations where speeding is a safety concern (short-term). Install gateway treatments on the northbound and southbound approach to the Mole Lake business district (long-tem). Install a two-way left turn lane through Mole Lake as a strategy to slow driver speeds (medium-term). Regarding non-motorized safety, there was a significant pedestrian safety issue on a section of the state highway that crossed Swamp Creek. As a result of the LRSP, an RSA was conducted and the Tribe was able to secure American Recovery and Reinvestment Act funding (ARRA) to build a bridge for non-motorized users parallel to the state highway. In addition, sidewalk and marked pedestrian crossings were installed throughout the reservation. The enforcement emphasis area dealt with partnerships. The Forest County Sheriff was contracted to provide enforcement on the reservation; however, the Department only had authorization to enforce traffic laws on the state highway and county roads. Therefore, the Sheriff had no authorization to enforce traffic laws on the BIA roads and they could only respond to crashes if called by the tribe. The LRSP presented several strategies for evaluating the options to provide enforcement on the BIA roads. The Wyoming LTAP Center developed a Wyoming Rural Road Safety Program (WRRSP) with funding from Wyoming DOT (WYDOT), Mountain Plains Consortium (MPC), and FHWA, and in cooperation with Wyoming counties. The main objective of the WRRSP was to develop and evaluate a transportation safety program that could help local agencies reduce crashes and fatalities on rural roads statewide. It was written to provide other local agencies with a framework to be used if they were interested in implementing a rural road safety program. Through this LRSP concept, local jurisdictions qualify for HSIP funding from the Wyoming DOT. Through the Spring of 2011, the WRRSP has allocated more than $1.5 million to implement low-cost safety improvements. As part of the study, a Local Road Safety Advisory Group (LRSAG) was established, including representatives from WYDOT, the Wyoming LTAP, Wyoming Association of County Engineers and Road Supervisors (WACERS), the Wyoming Association of Municipalities (WAM), and FHWA. Identify roadway classifications systems used by counties in Wyoming. Develop a methodology for using available data (crash records, traffic volume, speed, etc.) for crash prediction on rural roads. Establish a five-step methodology to identify safety measures on high-risk rural roads. Develop a procedure to perform economic analysisfor safety measures. Summaries of literature reviews for each of the three research objectives. Introduction of the detailed procedure of the WRRSP. The roadway classification survey and its results. The regression model methodology used to predict crashes on rural roads. The procedure for performing economic analysis for safety improvements. Summation of the conclusions and recommendations for future studies. The plan also provides forms, guidelines, photos, surveys, and sample data useful for implementing this framework in other jurisdictions. Approximately 60 percent of all road miles in the U.S. are non-Interstate, rural roads owned and operated by local entities, such as towns, counties, and tribal governments. In 2009, 56 percent of highway deaths occurred on rural roads, though only 23 percent of Americans live in rural areas. Furthermore, the fatality rate was 2.6 times higher in rural areas than in urban areas, underscoring the need to systematically improve road safety in rural areas. All States already have a comprehensive safety plan that provides a framework for reducing highway fatalities and serious injuries on all public roads; this is known as the State’s Strategic Highway Safety Plan (SHSP). The SHSP is a data-driven plan that establishes statewide goals, objectives, and key emphasis areas that integrates the 4 E’s of Safety – engineering, education, enforcement and emergency services. The SHSP can assist local practitioners in addressing safety on local rural roads but a locally-focused plan is often needed to address the unique conditions that contribute to safety problems and to assist local practitioners in making informed safety investment decisions. These challenges faced by local agencies can be addressed through the creation of a Local Road Safety Plan (LRSP). An LRSP is a locally-coordinated safety plan that provides a comprehensive framework to identify key safety needs and guide safety investment decisions on local rural roads. An LRSP provides an excellent opportunity for agencies at all levels of government (local, State, and Federal) and other stakeholders to work together to align and leverage resources and funding to address the safety challenges unique to rural roads. Successful development of an LRSP depends on fostering leadership and communication among various stakeholders. This can start with the identification of a safety champion. The safety champion advocates for the plan’s successful development, implementation, and evaluation. It is also important to establish an LRSP working group. This is the team responsible for developing the LRSP, performing duties ranging from defining each working group member’s role to tracking progress after the initial plan is developed. The working group also identifies and contacts other stakeholders who can further the LRSP process by helping to plan, implement, and evaluate the progress of achieving the safety goals outlined in the LRSP. Local road practitioners should analyze any available safety data to identify problem areas that will be addressed in the LRSP. Crash data should be used to identify safety issues. Typically, three years of crash data are needed to average out those years of extreme numbers. If crash data are not readily available, other safety-related data can be used to identify safety issues. The analyses of these data could range from simply marking locations on a map to using a spreadsheet to determine trends by location, crash type, or other factors. The working group should identify emphasis areas consistent with trends identified during the data analysis and the concerns of the various stakeholders. Strategies to address emphasis areas should consider the 4 E’s to comprehensively address safety. The proposed strategies for each emphasis area should be prioritized based on benefit (e.g., reduction in crashes) verses cost, the availability of manpower, the schedule for implementation, and the relative importance of each emphasis area. Some strategies can be implemented as part of a systemic improvement process such as providing rumble strips along rural corridors as part of a summer paving program or conducting an enforcement blitz. Detailed information on effective strategy selection may be acquired through partnerships with State or local agencies or by contacting the State Local Technical Assistance Program (LTAP). LRSPs should be monitored for progress to ensure implementation of strategies that support emphasis areas and to determine if new strategies need to be considered. This helps provide accountability and can be used to keep stakeholders informed and engaged. Evaluation of the LRSP strategies should be ongoing to ensure the effectiveness of the projects and the overall plan. Addressing safety on local rural roads can be challenging. The development of an LRSP can serve as a cornerstone to building a comprehensive safety program to address the safety challenges on the roadways. Depending on needs and jurisdiction, the LRSP will vary in size and level of detail. The LRSP is a living document and should be revisited as established goals are achieved. What is a Local Road Safety Plan – Presentation outlining what a Local Road Safety Plan is and how developing one can benefit [INSERT AGENCY NAME]. Identify other agencies or individuals who should be invited to join the working group. Summarize Data Analysis – An initial data analysis has been conducted prior to this meeting to provide the group with background information on a variety of potential safety issues in [INSERT AGENCY NAME]. Reduce annual distracted driving crashes from 100 in 2010 to 90 or fewer in 2020 (a 10-percent reduction). Reduce annual distracted driving injuries from 40 in 2010 to fewer than 36 in 2010 (a 10-percentreduction). Develop a public outreach campaign that coincides with other jurisdictions’ efforts to raise awareness about distracted driving. distracted driving a subsection of negligent driving. Increase the use of techniques that limit the frequency and severity. Reduce annual unrestrained crashes from 20 in 2008 to 5 or fewer in 2018 (a 75-percent reduction). Reduce annual unrestrained injuries from 16 in 2008 to fewer than 4 in 2018 (a 75-percent reduction). Increase safety belt use from 75 percent in 2008 to 90 percent or greater in 2018 (a 17-percent increase). Develop an incentive/recognition program for law enforcement efforts. Conduct an enforcement program that targets pickup truck drivers and passengers. Conduct sustained high-visibility enforcement initiatives. Continue current best practice enforcement and educational programs (e.g., Chiefs’ Challenge, Click It or Ticket). Provide more paid media campaigns in local publications. Reduce annual alcohol-related crashes from 9 in 2009 to 3 or fewer in 2014 (a 67-percent reduction). Reduce annual impaired driving injuries from 10 in 2009 to fewer than 2 in 2014 (an 80-percent reduction). Increase the number and effectiveness of sobriety checkpoints and targeted enforcement. Enact stronger and more effective legislation, such as license suspension or mandatory ignition interlocks for first time offenders. Develop educational programs targeting specific audiences, such as elementary and middle school students, or the 18-to-34 year-old age group. Create effective media campaigns in both visual and print media. Reduce annual aggressive driving injuries from 24 in 2009 to fewer than 20 in 2014 (a 17-percent reduction). Reduce annual fatalities involving excessive speed from 15 in 2009 to 10 or fewer in 2014 (a 50 percent reduction). Reduce annual injuries involving excessive speed from 100 in 2009 to fewer than 75 in 2014 (a 25-percent reduction). Change the driving culture by conducting and supporting public education and outreach activities that elevate the awareness of the dangers of aggressive driving. Educate the judiciary and elected officials on the risks associated with aggressive driving. Communicate the factors associated with aggressive driving to the transportation engineering and planning communities. Increase enforcement targeting aggressive driving. Reduce annual crashes involving teen drivers from 200 in 2009 to 150 or fewer in 2020 (a 25-percent reduction). Reduce annual injuries involving teen drivers from 50 in 2009 to fewer than 25 in 2020 (a 50-percent reduction). Review, evaluate, and improve the driver preparation program. Develop a program to increase enforcement, prosecution, and adjudication of young driver traffic law violations. Identify opportunities for engineering solutions to prevent young driver crashes through road safety audits and other measures. Conduct a public information and education campaign targeting the various aspects of hazardous locations. Identify best practices and innovative enforcement techniques to eliminate highcrash locations in high-crash pedestrian locations and in work zones. Conduct road safety audits targeting high-risk pedestrian and intersection locations to determine the contributing crash factors and identify effective countermeasures. Develop and implement projects to reduce or eliminate safety hazards or otherwise to enhance safety for road users. Reduce annual run-offthe-road fatalities from 8 in 2009 to 4 or fewer in 2020 (a 50-percent reduction). Reduce annual run-offthe-road injuries from 40 in 2009 to fewer than 30 in 2020 (a 25-percent reduction). Implement stricter law enforcement of motor vehicle laws and increase fines for serious violations that result in run-off-the road crashes (e.g., driving too fast for conditions). Improve data collection and analysis for fatal and injury run-off-the-road crashes to provide critical information to transportation planners and engineers. Evaluate pavement strategies to reduce speed and increase friction (e.g., pavement type, pavement application method, pavement marking spacing). Improve traffic control strategies to provide positive guidance to keep vehicles on the road. Implement forgiving roadway designs that mitigate the impact of cars leaving the road. Reduce crash injury mortality by 10 percent or greater by 2015. Improve electronic data and voice communications for emergency response. Improve resource deployment for emergency service response. Develop a safer, faster EMS response. Reduce annual intersection-related fatalities from 12 in 2009 to 6 or fewer in 2020 (a 50-percent reduction). Reduce annual intersection-related injuries from 60 in 2009 to fewer than 45 in 2020 (a 25-percent reduction). Reduce the number of conflict points and provide better guidance for motorists at intersections. Develop a system to track and evaluate countermeasure effectiveness at high-crash intersections. Encourage more multidisciplinary collaboration at the State and local level on intersection safety. Create intersection safety checklists for existing conditions and new design. Reduce annual pedestrian injuries from 15 in 2009 to fewer than 10 in 2015 (a 33-percent reduction). Conduct public education and outreach to motorists to raise their awareness of pedestrian and bicyclist safety needs. Conduct periodic roadway safety assessments of locations with growing traffic and pedestrian volumes and locations at greatest risk for pedestrian fatalities and injuries, and share information with other local partners. Implement effective countermeasures for problem areas as determined by roadway safety assessments. Educate the judiciary on the importance of penalties for violation of pedestrian laws. Identify opportunities for alternate funding; for instance, the Safe Routes to School Program. Reduce annual fatalities involving drivers 65 years or older from 12 in 2009 to 8 or fewer in 2020 (a 33-percent reduction). Reduce annual injuries involving drivers 65 years or older from 120 in 2009 to less than 100 in 2015 (a 17-percent reduction). Develop effective methods to identify at-risk older drivers. Develop enhanced training for emergency service personnel on the proper assessment and triage of older persons at crash scenes. Incorporate the Federal Highway Administration’s (FHWA) Older Driver and Pedestrian Guidelines into the local design guidelines. Reduce annual nighttime fatalities from 36 in 2009 to 32 or fewer in 2015 (an 11-percent reduction). Reduce annual nighttime injuries from 96 in 2009 to fewer than 80 in 2015 (a 17-percent reduction). Review, evaluate, and replace signage showing wear or reduced retroreflectivity. Review and evaluate locations exhibiting higher incidence of nighttime crashes for possible supplementary lighting. Improve crash report submission time from 90 days to 30 days. Identify best practices in crash reporting, as well as barriers to complete, accurate, and timely information. Standardize crash reporting policies and protocols for all agencies operating within the jurisdiction. Identify tools to increase timely and accurate reporting (e.g., GPS devices and laptops in responding vehicles). Discuss the current condition of the local jurisdiction with respect to roadway fatalities. Discuss the purpose of the plan and how the plan will help reduce fatalities and serious injuries. Vision: A vision statement describes what the group is striving to achieve. Mission: The mission statement defines the purpose of the plan, what it does, and what it is about. The mission statement usually does not change and helps to define organizational culture. Goals: What does the group hope to achieve in a specified amount of time? Goals should be realistic and measurable and can evolve over time. Discuss the process used to develop the plan, recognizing that the LRSP development process is every bit as important as the actual finished product. Because there will be many activities that lead to the LRSP, it might be difficult to determine whether the required process was followed just by reading the LRSP. For this reason, it is recommended that some documentation or explanation of the process be included in the LRSP. The LRSP is a living document and is expected to evolve over time. Turnover of team members is inevitable, and it should also be expected that many who were not directly involved in the development process will read and use the LRSP. By including some explanation of the development process, both new team members and those existing ones who were not as closely involved will be able to follow the progression of the plan’s creation. A section on the development process or reference to documentation will also help approving officials. Discuss how the data were gathered and analyzed. Include any concerns about the quality and reliability of data, improvement needs, and assumptions. List emphasis areas, explain how they were determined, and why addressing them is vital to achieving plan goals. The list will serve as a quick reference and introduction to the body and structure of the plan. The following information should be provided for each emphasis area and can be entered into the chart located in Appendix C.
The background for the emphasis area should include a brief explanation regarding why this was important to the LRSP. In this section, the writers should provide fatality data and show trends via graphs and charts to demonstrate need to address this issue. What measures will be used to monitor progress in attaining this objective after implementation? List the strategies that will be performed. These strategies should include actions that can be performed by the 4 E’s, if appropriate. Each strategy should include a performance measure. These strategies will be carried over as action plans that are created for each emphasis area. Further information about what, how, when, where, and who of safety activities will be included in the action plans. Action plans can also provide specifics such as various funding sources for safety activities and may also contain some project-level detail, responsible agencies, and timeframes for safety activities. Discuss how the group plans to implement the LRSP. Include a schedule of projects or how projects will be scheduled (i.e., action plan). What will the evaluation process entail and how often will evaluation take place? Is someone responsible for monitoring progress throughout the year,and when will plan revisions be made? How will the LRSP evaluation affect future projects funded through HSIP or other funding sources? How will the project evaluations in these programs affect the LRSP? To keep everyone engaged and on task, discuss what comes next and who is responsible for what and when. What are the partners’ responsibilities and what will each of them do with the plan? Remember, this is a living document! This section could list other plans that were referenced in the development of the LRSP, such as the State’s SHSP, as well as provide more detail on the emphasis areas described in the plan. The LRSP is a strategic planning document and is intended to be concise. Action plans are based on the emphasis areas outlined in the LRSP and expand on the supporting data and strategies. These details would describe the what, how, when, where, and who. Action plans can also provide specifics on funding and some project-level detail. They may also include evaluation criteria for assessing the success of the implemented safety strategies. Ideally, each emphasis area in the LRSP should be supplemented with an action plan. The National Association of County Engineers (NACE) has a page on its website (http://www.countyengineers.org) devoted to the promotion of safety on country roads.